General Robotics Discussion / Boston Dynamics "Spot"
Moving with its own onboard power source, climbing stairs, uneven and loose terrain, and adjusting to external unexpected forces. That is one cool machine. Questions / Tiny ESCs needing recalibrated often? I know they offer calibration and I'm using a Spektrum DX6 with a BR6000 which is known to limit throws in the mixing so once I got the bot set up I decided to try to calibrate the controllers. Once I completed the calibration full forward worked ok, and neutral didn't move the wheel but full reverse only gave a very slow response. I figured I must have done something wrong so I just reset the calibration back to default (by not moving the stick during calibration) and everything seemed ok. Then later on one side seemed to lose calibration and stop working entirely even though I had the jumper contacts taped over. I thought maybe I had just only done one controller and forgotten the other so I reset the one that wasn't working and it was ok for a little while. After that I moved on to working on other parts. All of this testing was done with a 4S A123 pack. Once I had everything else ready I moved to the 4S 1300mah TP lipo pack that will be the real one. I took the bot over to my test box and powered it up and... nothing. Both drive sides didn't move. The controllers are flashing red (I don't think it is loss of signal red). The weapon worked fine though. Cycling the power on the bot didn't change the behavior. I took the bot back to the bench and on a whim decided to reset the calibration on one side back to defaults again. That side started right up and the other side is still disabled. I've tested the RX with a servo and rx battery. Unplugging the weapon ESC and plugging in an rx battery doesn't fix the one that lost calibration but the one I just recalibrated works with that setup. I'm wondering if my BEC on the HK weapon controller is flaky and I'm going to try switching to the BEC from one of the tiny ESCs to see if that helps them keep their calibration. 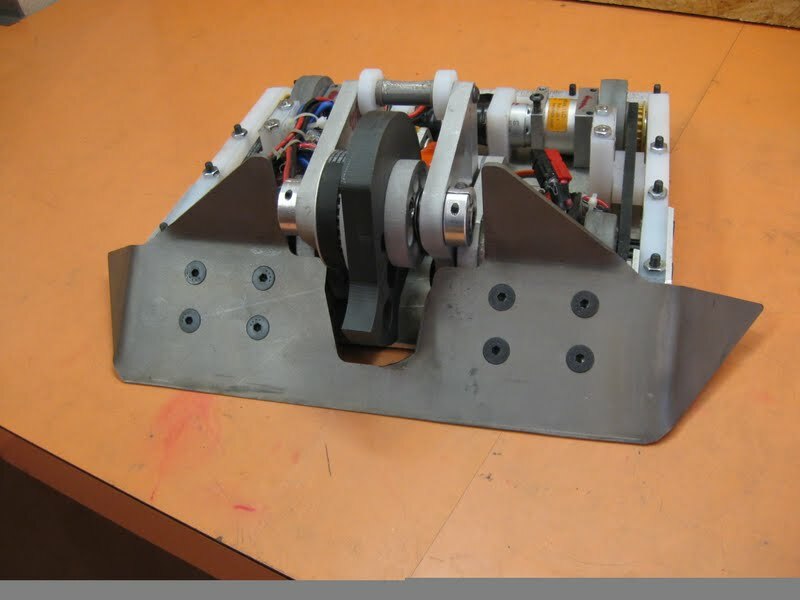 This bot was the first of many prototype versions of flywheel powered flipper I worked on. I had bad tools and a small budget and finished it 11 PM before its only competition where it went 0 and 2. 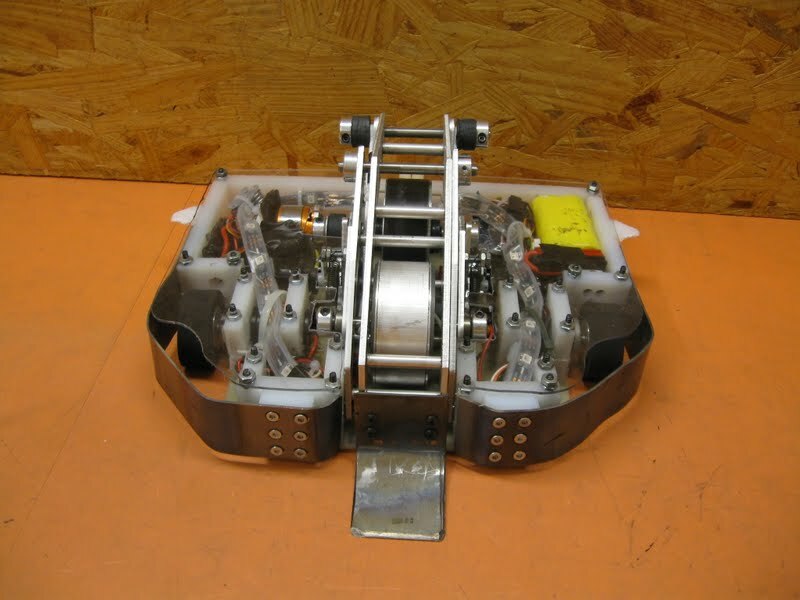 This bot had many iterations and competed several times at the PA Bot Blast. 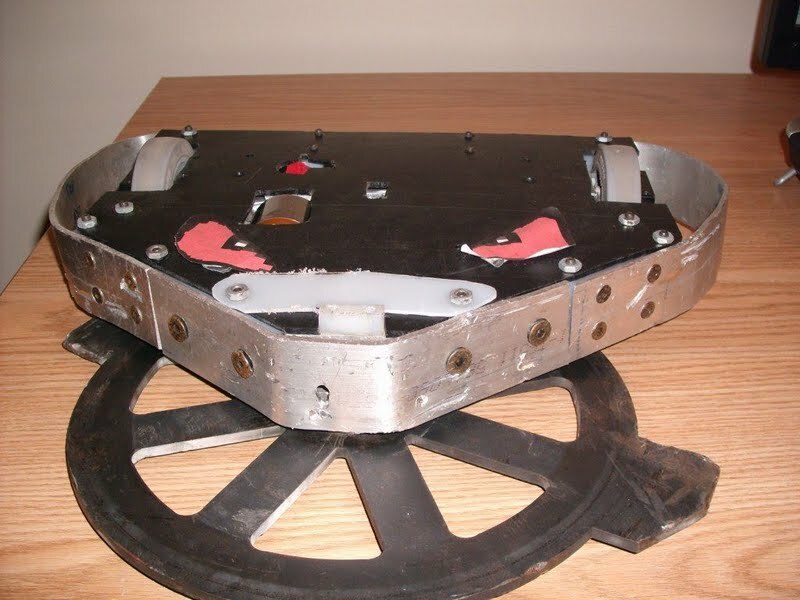 It was where I developed the flywheel powered flipper and clutch mechanism that I now use in my Sportsman bot. It won the PA Bot Blast at least twice, maybe three times, but got trashed by One Fierce Bushwhacker this year. It was never likely to do well in a full combat class because I spent everything on making the flipper as good as I could. I don't think I'll be able to be successful with a flipper now that spinners are coming so I'll probably retire it and do something else fun. I built Weakened Warrior in 15 hours over a single weekend out of only spare parts as an experiment. 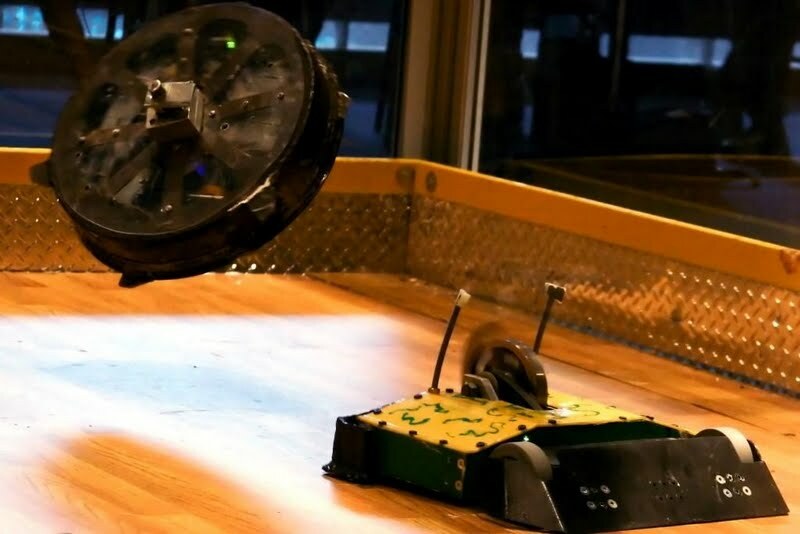 The mantis class was mostly sportsman-esque bots that year though and the bot ended up being so violent that I decided to only run exhibition matches and let the audience drive it to drum up some interest. Only one person wanted to try it out and it turned out to be a little hard for him to get the controls down. That's what 15 hours will get ya I guess. 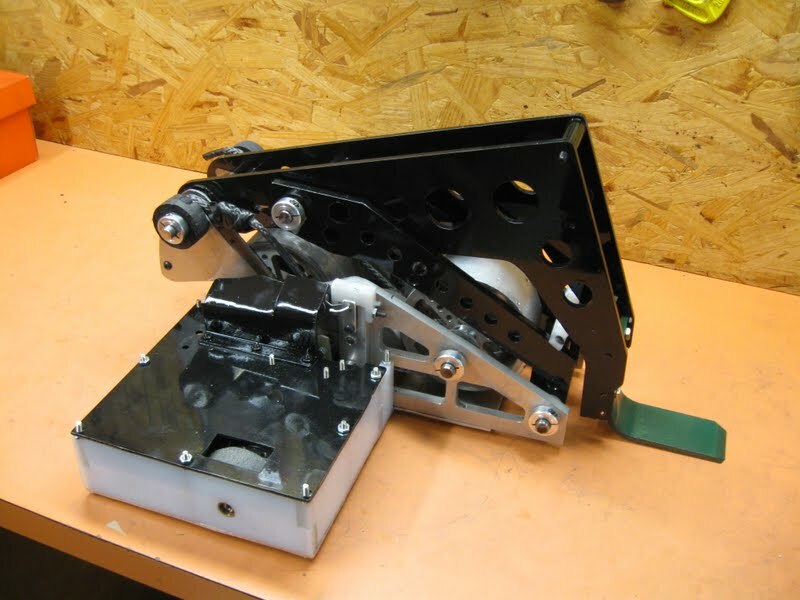 I'm revamping the bot as half a multibot for Moto 2015 named Chop Block with Chris A's mantis wedge bot. Devour only competed at Motorama 2011. I built it to see if I could make a vertical spinning bot that spins "down" a successful design. The blade was my first vertical one, and was asymmetric with only one tooth. It was sunken into a .125" ti swept-back wedge and was mounted on a hinged weapon mount that had a bungee return built in. 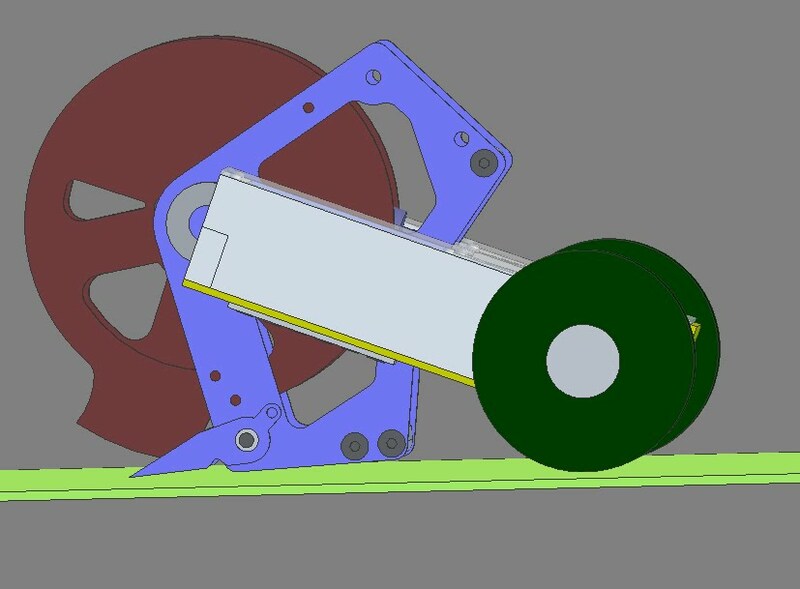 The idea was to hook the blade over drum teeth or frame rails on other bots and try to break the screws and pull the frames apart. The belt setup for the weapon was crappy so the weapon didn't hurt enough to do what it was designed for. The drive and wedge were both solid though and I was able to get a lucky second place finish after Surgical Strike had electrical problems against me. It was a tough bot but not quite tough enough. This is my only bot to almost hit the ceiling of the box and it got totally destroyed by fighting Cataclysm twice. vs Cataclysm #2 - http://www.youtube.com/watch?v=XsKOmUT-x_8 Did it just spin up FASTER?! Featherweight shell spinners: Bipolar, Tripolar, Steel Shadow, Tetanus, Triggo. All retired except Triggo. Ok, I've been building shell spinners a long time, in fact, I've had one at every motorama since 2004 I think. The success of the bots has varied some. Bipolar was a cooking wok with giant 1" holes drilled in it to make weight and it went 1-2 at Moto 2004. 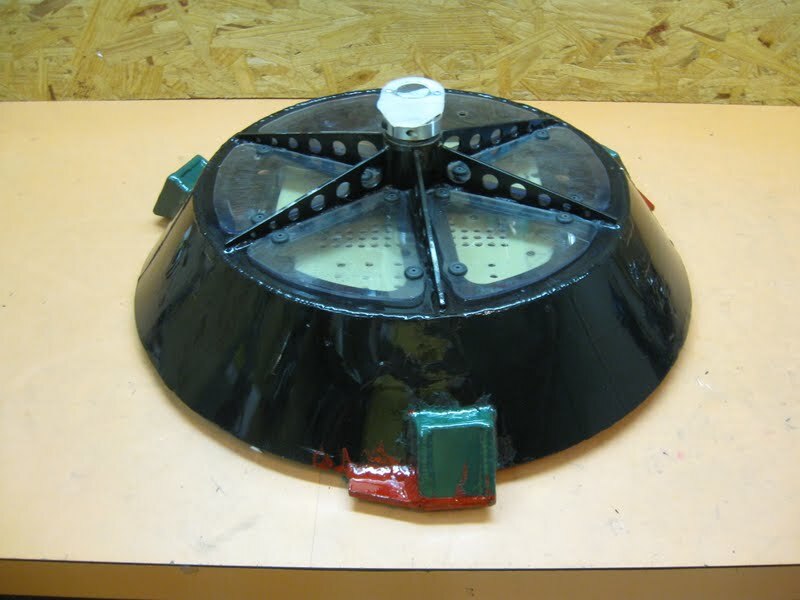 The second version had an 8.5 lb aluminum cooking pot based shell and went 0-1 at RCRA 2004. I drove 22 hours to alabama to get one fight... but I had fun! Tripolar had several different iterations but was my first bot to go 2-2. It originally used 2x Astro 940s at 24v to the 15.4lb shell @3000 RPM ish but the motors kept breaking. I then switched to an AXI 5330 and have been using it ever since. Tetanus was my first successful FBS. It started at FI 2012 and got 2nd after losing to Mangi because I couldn't get through the .75" UHMW front with all my little blade teeth. I ended up melting a battery in the fight but the bot translated great and the shell spun great... just needed better teeth. I eventually upgraded the teeth to giant hammers instead of little blades, and after that the bot never had a match go 3 minutes and never lost another match. It won Moto and FI from 2012 to 2014 (though Moto 2014 was really really close). The big hammers had a downside though, the shell slowly got more and more bent every time I hit somebody with it until eventually it could barely spin at all. Triggo is the updated version of Tetanus, and my only active Combat Featherweight. 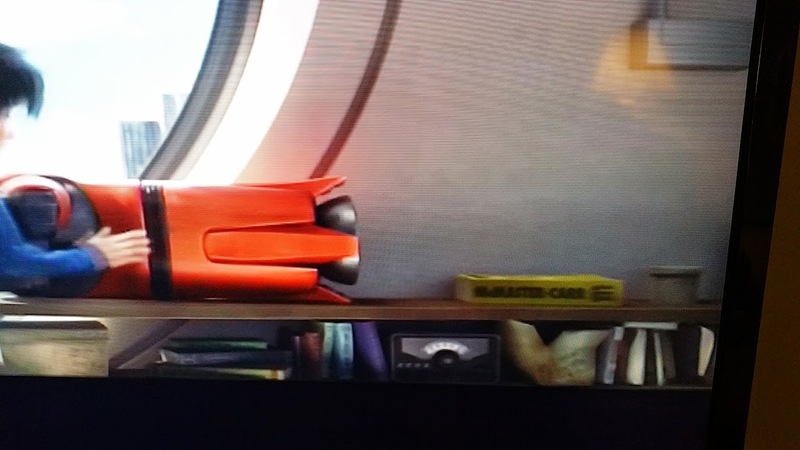 I had to sacrifice some mobility and stability for a stronger shell. It doesn't translate as well as I want, but not as badly as Steel Shadow either. It has only had one fight so far but performed well in that fight. I'm still using the same AXI 5330 @30v since October 2010 but this is the first bot that put the friction roller right on the motor shaft. The shell is 16.5 pounds and about 18" tip to tip on the teeth. 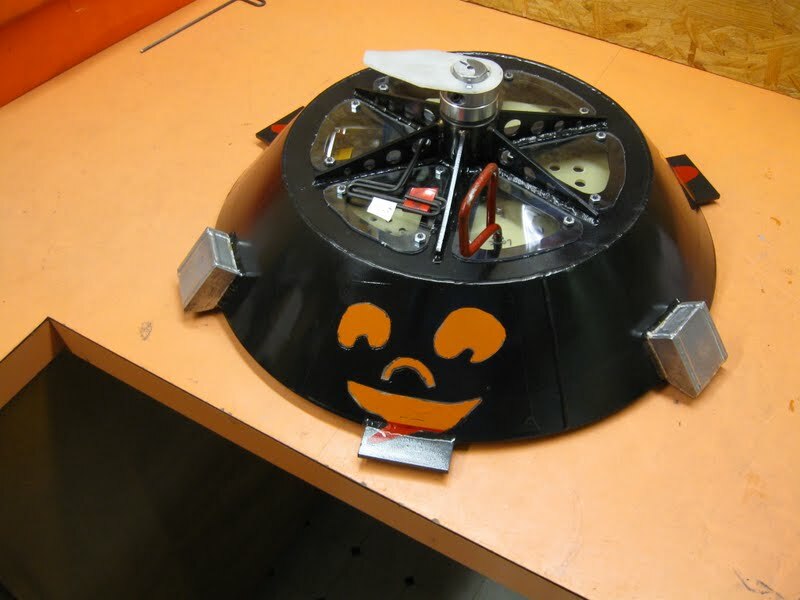 Its first competition was right around Halloween 2014 so I painted it to match. 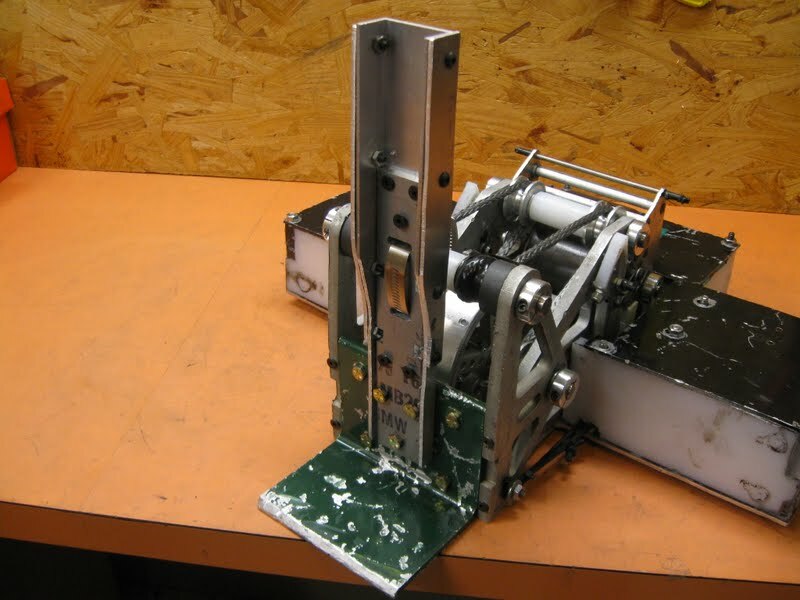 Magneato is a flywheel powered flipper with an auto-resetting clutch and a 4-bar linkage for the arm. It has had a couple of different iterations. The first iteration could barely self right and competed at Motorama and FI 2014. I'm currently working on an upgraded version for Moto 2015 that has been able to self right reliably in my tests. 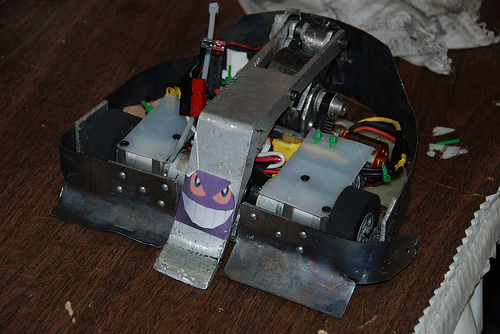 It has an on-board Arduino that controls the timing of the flipper mechanism, weapon throttle, and senses the opponent on the flipper. This is my coolest bot from a design perspective.